Managers that oversee in-plant print and mailing operations know that understanding their costs is essential to sustaining the operation; whether they’re on a chargeback system or justifying the need for in-plant services. With constant pricing pressures from outsource vendors; cost estimates, chargebacks, or prices that are off just a few dollars can have a substantial impact on the perception of your parent institution and customers. 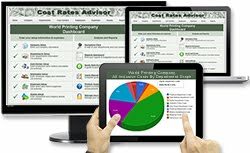 CostRatesAdvisor.com budgeted hourly rates software helps solve this problem by determining the minimum rate you must charge for production equipment and services in order to break-even. CostRatesAdvisor will help you to determine your true costs, provide services below market cost, identify the savings to the organization, and maintain a positive perception from your parent institution. The user-friendly design makes it easy to figure the cost rates of your equipment and services. Just enter your budget or expenses, or import them using our intelligent Data Import Wizard. CostRatesAdvisor automatically calculates the out-of-pocket cost of your equipment or services using built-in industry best practices and formulas. Use the rates to produce more accurate cost estimates and job cost analysis in your Avanti, Pace, Enterprise 32, Printsmith, Franklin, PrintLeader, Monarch, CRC, or whatever software you use. CostRatesAdvisor is used by in-plant and commercial printing operations throughout the United States. Rates can be computed for creative services, offset presses, digital production printers, copiers, large format, cutters, folders, collators, binders, mailing, handwork, and more. CostRatesAdvisor runs in the cloud so there's no need to have IT install or download software. You can access it from anywhere, anytime using any PC, MAC, notebook, iPad, or tablet with a compatible browser and internet connection. Your data is protected and secure using strong encryption and password standards. As production trends, expenses, budgets, equipment, and employees change throughout the year, you can easily update your rates so you’re not under-recovering or over-recovering costs.